Teenage Fanclub sounds timeless as the band upsets the pure melodic centers of these songs with masterful, subtle shifts in layering and tone. Teenage Fanclub takes its time. The band took five years between 2000's Howdy! and their first album for Merge Records, 2005's Man-Made, then another five years before 2010's Shadows. 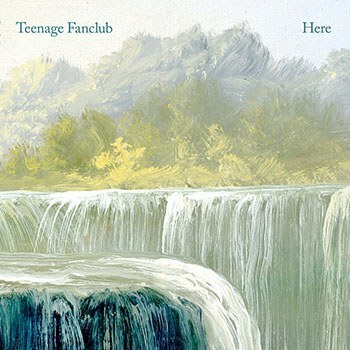 And now, six years later, Teenage Fanclub is back with Here. But there's something in the band's sheer consistency, and the way their sound seems more timeless with each passing year -- Bandwagonesque, once tied indelibly to the grunge boom, feels just as fresh now as ever -- that suggests time between records doesn't matter. An album like Shadows has enough ripples to reach up to now, up to Here. That idea of time seems significant now, though, because the plain-spoken title of Here sets up an album very much interested in time. In the passing of it, in the time to come, in the way these things can both inform the present but also distract us. Some of the loudest, most memorable lines on this record come in the form of simply stated mantras. Early on the record, we get lines like "hold on to your life, to your dreams," which sets up a song like "Live in the Moment", which insists "nothing this good can last forever." Opener "I'm In Love" finds Norman Blake claiming not to be in love with "you", but rather to be "in love with your love," a feeling that can come out of any and all moments, out of not just then but also, and more urgently, now. But if there's a thread going through this album about appreciating the moment you're in, Here pushes this sentiment beyond the simple platitude it might read as on paper. In fact, all around these proclamations lie the tensions, complications, and struggles that make staying in the moment so difficult. Over the hazy, day-dawning opening of "Steady State", Raymond McGinley quietly sings, "Wake my love, we've dreamt enough," and continues by claiming, "The steady state of life is calling." But McGinley's vocals, soft so as not to disturb on one level, also have a hint of something at the edges -- regret, resignation -- that regrets having to leave the life of dreams, to leave the comfort of bed with one you love, to start the day and move forward. Here is not just a pragmatic space of clarity, but it can also be limbic, between the fog of thought and the light of day. Dreams come back often on this record, as on "Hold On" and, later, in "The Darkest Part of the Night" which claims -- not now, but later -- "I will dream of you tonight." All around these still moments, where the songs take stock of a moment, there's the "smoke and mirrors" of Gerard Love's "The First Sight". In "Hold On", Teenage Fanclub warn us not to "get caught in their schemes." At the end of the record, the quiet, shadowy "Connected to Life" feels like a dark turn against the bright hues that dominate the record, but instead that darkness marks a shift in focus. Much of the music here wants to be the brightness that pulls us out of the dark, the dark of regret (rooted in the past) or worry (rooted in the future). But "Connected to Life" ends Here by laying all that trouble out up front, while still wishing just to "see you connected to life." The tension on this record, and it's a bittersweet and resonant one, comes in the opposition between the person trying to stay in the moment, to see the important things in their life, and the world around them constantly trying to shift their focus, to distract them into considering something else, something lesser. Teenage Fanclub digs into this tension with some of their headiest compositions in recent memory. Here is a more scuffed-up record than Shadows, a more varied record than Man-Made, but also builds on the strengths of both of those records. Shadows had its distorted moments, but much of the louder layers served to accentuate the sweet melodies. On Here, the balance between melody and whipped-up layer is a bit more complicated, and it portrays well the album's central tension. The way "The First Sight" opens up from dreamy melodies into towering guitar riffs and horn sections. The keys and dusty fills that tangle up the end of "I Have Nothing More to Say". The quiet chords that yield to the loud propulsion of "I'm in Love". The brilliantly layered vocal harmonies clashing with distorted notes on "It's a Sign". Every turn complicates and muddies up the album's power-pop center without distracting from sweet hooks and beautiful turns of phrase. In short, to listen to Here is to engage with its thematic complications. Every song keeps you in the moment, keeps you paying attention. But it'll go with you into the future; it will ring in your ears. And, eventually, you'll think back fondly on the first time you heard these solid and shifting songs.